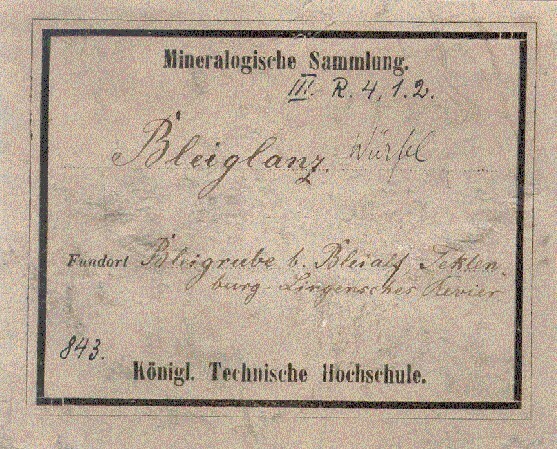 The Mineralogical Collection of the Technische Universität Berlin is looking back on a history of more than 230 years. It belongs to the five biggest and mineralogically most important collections of Germany. 1770 foundation of the "Bergakademie" (i.e. mining academy) by the Prussian king Friedrich II., the "Great"
foundation of the "Königliches Mineralienkabinett" (i.e. royal mineral cabinet) of the "Bergakademie". 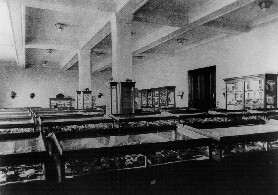 the "Mineralienkabinett" becomes "Mineralogisches Museum" (today in the "Museum für Naturkunde Berlin", i.e. Natural History Museum Berlin); second owner and owner of the teaching collections remains the "Bergakademie": end of the common history with the mineralogical collections of the "Museum für Naturkunde"
acquisition of two private collections containing more than 50.000 pieces for the "Technische Hochschule"
inauguration of the mineralogical museum at the "Technische Hochschule " by Prof. J.Hirschwald. 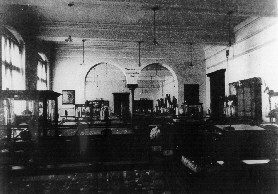 Mineralogical Museum of the TH Berlin, between 1885 and 1916.
the "Technische Hochschule" becomes "Technische Universität"
since dec. 2005 reconstruction of the building, show room temporarily closed.